PLT-2W Point Load Test System - OFI Testing Equipment, Inc. The Point Load Test is performed on core rock specimens or irregular rock fragments to obtain the point load strength index and unconfined compressive strength of the rock. This test does not require costly specimen preparation and is a quick, simple test. The failure load P and the distance between platens D are measured to obtain the uncorrected point load strength P/D2. A correction is applied to account for the specimen size and shape, and the unconfined compressive strength is obtained from a correlation equation. Depending on the specimen geometry, three types of tests can be performed: diametral, axial, and irregular lump. 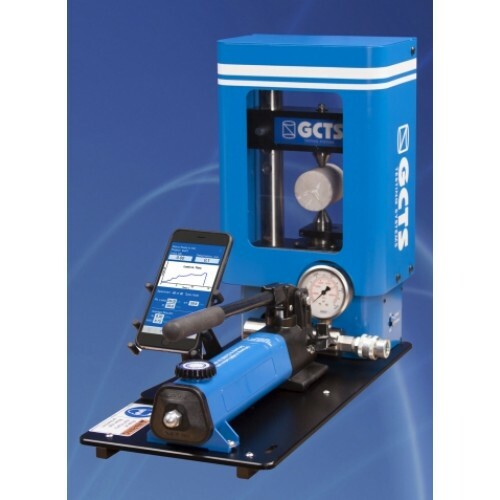 The GCTS Wireless Point Load Testing System is an apparatus made of high-strength anodized aluminum that incorporates digital technology to increase precision and ease of use while reducing its size and weight. The apparatus weighs less than 16 kg and the standard unit can apply loads up to 100 kN (22.5 kips). A pressure sensor is used to measure the applied load, increasing the accuracy at any load level over traditional pressure gauges. The system can wirelessly connect to an iPhone, iPod, or iPad through Bluetooth and all measurements are recorded in an application. The GCTS Wireless Point Load Testing System is a convenient test system that has been designed for ease of transportation, increased productivity, optimum mass production, and maximum precision. The GCTS Point Load Test Application and an iPod Touch are included with the Point Load Testing System. This application allows all data to be recorded automatically, therefore increasing the speed at which testing can be performed. The application has a two-point calibration for the crosshead position. Three different specimen shapes can be used – diametral, axial, and irregular. The application can be set to perform tests with each specimen type and shows the user exactly which dimensions must be measured. All dimensions can be measured using the application by placing the specimen in the cell in the direction specified by the application and applying a small load. The application will automatically read the specimen dimension and record it. Once all measurements have been made, the operator can begin the test. The application will automatically correct the data to account for the frame stiffness (causing the frame have an infinite virtual stiffness) and will graph the load versus time in real-time. After the specimen fails, all data is recorded and a new test will automatically begin. If all samples have a dimension that is the same, the application can be set to use that measurement for consecutive tests, speeding up testing if using specimen from the same coring sample. Once all tests are performed, all collected data can be emailed from the application as a Microsoft TM Excel Spreadsheet. The application can be set to use custom polynomial equations for the calculation of the unconfined compressive strength. During and after testing, the application will automatically calculate and display the average Point Load Strength Index, Peak Load, and Unconfined Compressive Strength for the sample. Optional fixtures and applications are available to perform unconfined compression tests and indirect tension tests (Brazilian tests) on rock specimens. These applications also allow for automatic data acquisition and therefore more rapid testing. Another option for the GCTS Wireless Point Load Testing System is a set of ultrasonic platens for the measurement of P-wave velocity. This gives a more accurate correlation between the point load index and the unconfined compressive strength. Wireless Point Load Testing Apparatus to measure the point load strength index (Is). Two-column vertical standing assembly with perforated columns for crosshead adjustment and acrylic shield. Made of lightweight highstrength anodized aluminum and alloy steel. Maximum vertical daylight opening: 175 mm. Horizontal daylight opening: 100 mm. Load frame safety enclosure with large viewing window. Includes hydraulic loading jack 100 kN load capacity and 60 mm stroke, base, and protection goggles. Load and deformation sensors included. Wireless Data Acquisition and Display. Automatic data acquisition and result calculation. Results displayed in real-time on iTouch/iPhone/iPad through an application. The unit comes with an iTouch device. Pressure sensor 69 MPa (10,000 psi) range to measure load. Set of (upper and lower) hardened steel point load platens. Operates with 4 standard AA batteries.